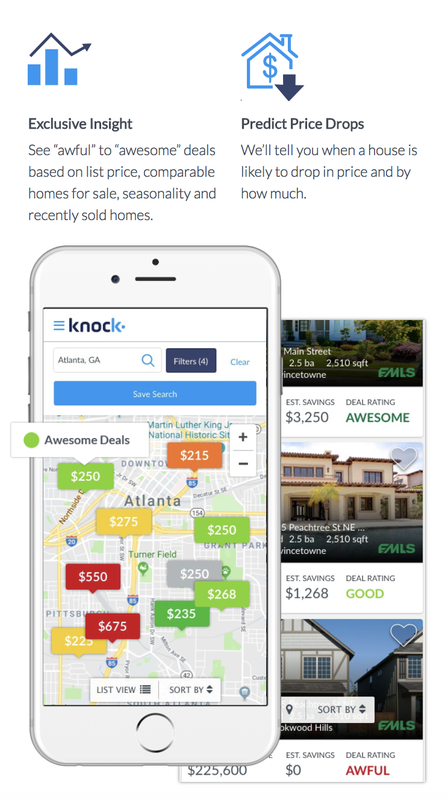 Knock Deals, a new search tool rolled out last week, uses machine learning and predictive analytics to rank listings based on their value to the buyer and seller. By predicting the final sale price, likelihood of price changes and total days a home will stay on the market, the tool rubber-stamps properties as “Awesome,” “Good,” “Fair,” “Poor” or “Awful.” An “Awesome” rating is one in which the home is predicted to sell below the list price within four weeks. “We are excited to expose this intelligence to consumers, empowering them to make more informed decisions not only about their new home purchase, but also how to realistically price their existing home,” said Knock co-founder and CEO Sean Black in a statement. As market conditions change, the homes ratings will also be updated based on price changes, inspections and comparable home sales in the home’s area. The idea for Knock Deals came, according to Black, from the desire to help both buyers and sellers better understand the housing market. Through the search engine, users can see a property’s current list price, comparable homes for sale, seasonality and transaction history and home inspection data. “Knock’s proprietary predictive algorithms are the foundation of our Home Trade-In platform because they enable us to determine the right listing price and estimated time to sell for each customer’s previous house, as well as help them get the best possible deal on their next home,” Black said. Launched in 2016 by Trulia.com executives, Knock offers to buy homeowners a new home all-cash and resells it to them, while also listing the old one. While the company originated as an iBuyer platform, it has since expanded to include the trade-in model.